When I opened the card, a little tissue wrapped packet slipped out. I wonder what's inside? Saint Nick! I had been hopeful of winning this fellow when Linda had a give away on her blog but alas, I was not successful. Well...until now! He is absolutely beautiful, pictures really do not convey how exquisite these sticheries are. Saint Nick is alreay hanging on the tree. 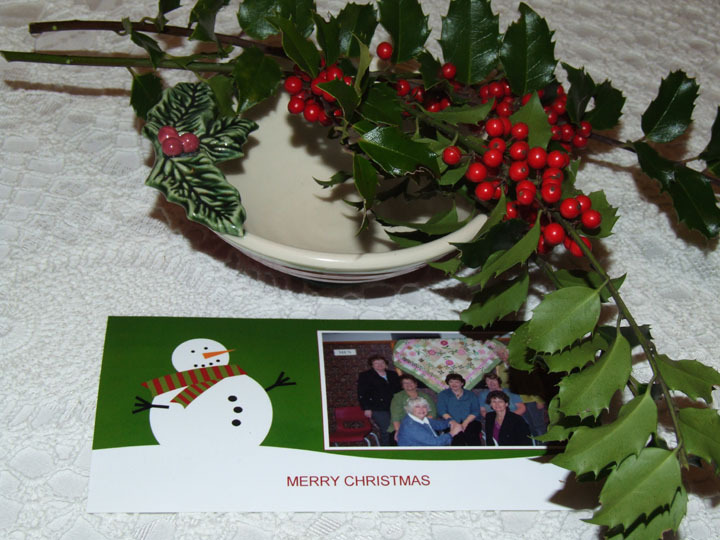 Many thanks Linda for your thoughtfulness, and for providing a wonderful Christmas surprise. This week in the mail I received a card which caused me to laugh right out loud. It was a group picture of the crew from Shelburne taken during one of the Fibre Arts Festival workshops, fashioned into a Christmas card. It made me laugh as I had jokingly referred to "our Christmas card photo" back in the post I wrote at that time. Sheila remembered the comment and went to the effort of getting the card made. Thanks so much, Sheila; that's one for the album for sure. Little fun surprises like this are a big part of the joy of Christmas. In that spirit, here's a little surprise for Rosa from Ohio. Rosa and I have been corresponding about a new design for some wedge placemats to fit her round table. To test the size and the accuracy of my templates, Rosa stitched up this sample with material she had on hand. She was pleased with her results and it will become a gift for a toddler friend. I hope you enjoy sharing your workmanship with the world, Rosa! This Maritime Beauty was stitched by Sheila Smith from Cape Sable Island, Nova Scotia. Sheila was part of a spirited vanload of quilters from Shelburne County who attended my workshop at the Fibre Arts Festival in October. Her guild worked on a foundation pieced project last month and that was enough to get Sheila in gear to try her Beauty. The group intends to do more foundation projects in the new year, so we will watch to see the results. Great job on the Maritime Beauty, Sheila, and with the machine quilting. Impressive indeed! I really like when the colours are placed to allow the centre square to stand out; in my eye, it makes a nice foil for the curves and spikes. Please click on "comments" at the end of this post to tell Sheila you stopped by to admire her lovely work. For the second Sew and Tell, you'll have to skip over to Gail's blog to see her latest Yuletide Jewel. Edit: 10 am This picture just in from a friend's iPhone, taken at the Nova Scotia Museum of Industry in Stellarton, N.S. It is very cool to see Canadian Heritage Quilting sharing shelf space with two other Maritime quilt classics. How wonderful! While most everyone is occupied with wrapping gifts at this time of year, beekeepers have the added responsibility of wrapping their hives for over-wintering. It can be a big chore to prepare for the cold and we have been working away at this over the past few weekends. Today it was time for the tar paper and Tyvek. Each hive is wrapped individually. ... but we did it, and all are wrapped snugly for a long winter's sleep. We even added a bit of Christmas for them. The hive sporting the bow is the Queen Street Swarm which had a very productive and successful season. Earlier this week my friend Lynn came to visit; she knitted on her thrummed mittens while I quilted. 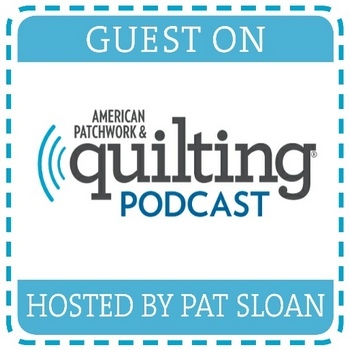 As we worked, we chatted about our approach to choosing what to quilt on a top. As stated in previous posts, I always think of the advice given by an experienced stitcher many years' back: "quilt what you what them to see." With that in mind, I have been stitching gentle, curly swirls on the main blocks of my quilt. What I want seen are delicate, lacy, filigree wings...even though the block itself has no resemblance to wings. As this is a bed-sized quilt, I am conscious of adding too much quilting; in my mind, there needs to be room left for a little "poufiness". For sleeping, one wants the blanket to have a soft hand, rather than a stiff feel. While I yammered away about "pouf", Lynn shared a different perspective on the quilting issue... but one which produces the same end result. She terms those open pouf spaces, "a place to rest one's eyes" and suggests that over-quilting a piece can be tiring for the viewer. I hadn't considered it in quite those terms before and I found that interesting. Lynn was working a picot edge on the cuff of her mittens and I decided that would be a nice frilly addition to my wings. To make the template to keep my scallops fairly even and regular, I traced the edge of the block on cardstock. A roll of tape worked like a charm to mark the semi-circles as it has the centre point identified on the clear dispenser. I just plopped the roll over my line and traced inside the small circle. Then I cut the cardstock with scissors. 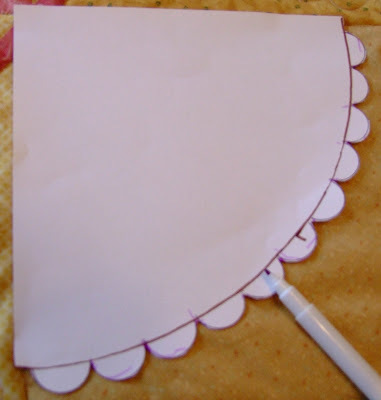 A purple, air soluble marker was used to trace the scallops on the fabric. Similarly, a cardstock template was made to mark the scrolls on a curvy line up the centre of the plain border. The picots were repeated along the outer pieced border of the quilt, but other than that the wool batting was given space to plump and pouf and look invitingly soft. Hopefully, the amount of quilting on this piece has reached the perfect balance to rest one's body as well as one's eyes. Now complete with binding and hanging sleeve, the quilt will wing it's way (pun intended) to Quilter's Connection for the spring issue. Once the editor gives the go ahead, pictures of the full quilt will be posted here. Yesterday on a whim, hubby and I attended a flea market here in Amherst. This is not something we normally do. We browsed through the selection of used furniture, appliances and dishes and were headed to the door when I spotted this. It looked suspiciously like a sewing cabinet. I asked hubby if he supposed there was anything interesting inside, so he lifted the lid and peeked in. Lol!!! It was too funny...and too good not to bring home. Oddly, on the front of the machine it says "Made in Italy" which I found rather intriguing as Berninas are made in Switzerland. It weighs a ton, but thankfully there was help offered to get it to the car. On the drive home I pondered the "Made in Italy" thing and my dear hubby asked if I had checked the spelling of the name closely, teasingly suggesting perhaps I had actually purchased a Berninina, or Berninio or some such thing! Although a bit dinged with nicks and scrapes, the solid cherry wood cabinet has potential as a nice side table in my sewing room, if nothing else. The missing knobs can easily be replaced. The cabinet is surprisingly sturdy and the machine fits inside with perfect precision; it is very well crafted. The front door swings open for a little storage compartment. The bar you see hanging down under the machine is a knee lift. The machine only sews a straight stitch, which I am guessing is a clue to its vintage. Some web investigation is in order to find out the history of this model. It was a fun find. 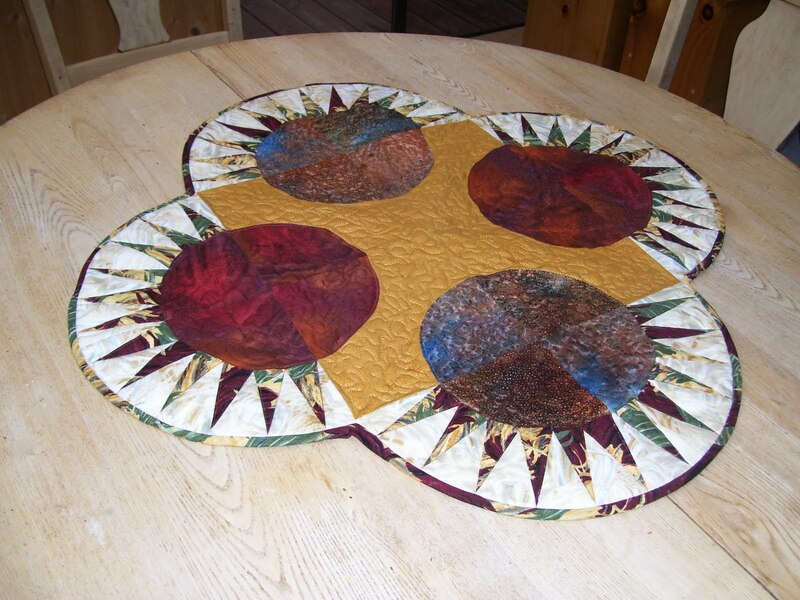 Skip on over to The Quilter's Net blog and see the latest Yuletide Jewel from Bev! I bought a new gift for my beloved: a straight stitch throat plate. The throat plate that comes with the Bernina (and on most multi-stitch machines) is a versatile one which will accommodate a zigzag or decorative stitch as well as a straight stitch. Having been "raised" on a machine where I always switched plates, I can see the benefits of having the tiny hole for the needle to pass through. It makes perfect stitches even more... perfecter. (Those who know me will understand how I cringed when I wrote that, having been an English teacher in a past career *-) If you scroll back up to the top picture, you will see it comes with a bright orange warning to help you remember to change the plate when you are changing your stitch width. Otherwise, good bye needle. I used the plate to start the free motion quilting on my spring quilt. I can't show you the front of the quilt yet, but here's the back. Can you tell what motif I am quilting? Only 32 more of these to do before moving on to the next section. So far, so good. As I basted pastel fabrics for a spring quilt... ... the Christmas cactus bloomed brilliantly in the background, a reminder that a different season is upon us. Outside everything is white from last night's snow. It would be nice to think that I'm way ahead of myself but alas the opposite is true...! The Christmas season kicked off in fine style last night in Amherst, Nova Scotia. Each year the town celebrates a "Victorian Christmas" and this year the theme has added a Maritime slant. The festivities began with a light up in Victoria Square in the centre of town. There was a huge turnout gathered around the bandstand as town crier Gerry Randall issued the official declaration to open the season. The mayor said a few words and then flicked a switch turning on all the lights. It was magical. 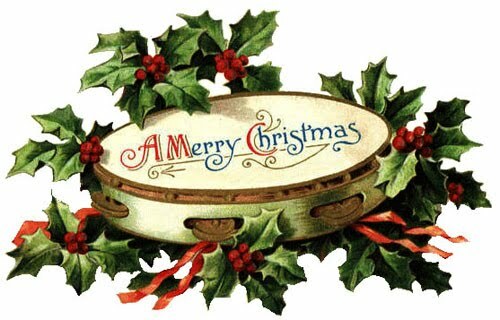 The Sackville Citizen's Band played as we sang Jingle Bells and then all trailed inside the Baptist Church for a carol sing with the ARHS Senior Concert Band. The sanctuary holds over 700 people and it was jam packed, with many folks standing. The band did a stellar job as usual...especially one little drummer boy :) During the last carol, folks exited the sanctuary to continue the festivities at Dayle's Department Store just up the street, singing as they walked. Store decorator Jackie Estabrooks really outdid herself this year. With help from the staff, as well as assistant Ashley, she has made dayle's look even more amazing than usual. The centrepiece of the decor is this full masted schooner built by talented staff member Darren Allen. The choir sang from the staircase and the Sackville Citizen's band played carols as each section of the store was lit. As the carols continued, refreshments - including shortbread cookies -were served. Under Jackie's direction, each department decorated their own tree in blue and blue/green, all in a nautical theme. The Nova Scotia tartan was also widely used. Here you can see a whimsical whale's tale, and a Christmas sprite with a gift dangling from a fishing pole. What imagination! Even a grouping of lobster traps was made to look festive. The store looks incredible, and is well worth a visit to see this in person. Tonight the fun continues with the town Christmas parade. That special drummer boy of mine will be marching with the high school band. The weatherman is predicting snow, something needed for a perfect Maritime Christmas. ...or should we say "Linda's Masterpiece"? Fellow blogger Linda has finished her Farrago done in Christmas prints. Linda made this for a gift...but I think it's ok for me to post the picture (don't tell!) I had the pleasure of meeting Linda for the first time during the N.S. Fibre Arts Festival in October, but I have been enjoying looking at the lovely quilts on her blog for some time. She used red Invisifil for her quilting and a needle punched batting, as this will be used on a table. I look forward to seeing what Linda makes next. If you'd like to make your own Farrago, ask for the pattern at your local quilt shop, or find it online here, #409. Last evening I grafted the toe on a pair of socks destined to be a Christmas gift. I am really pleased to have these finished and hope to have time to make one more pair before The Big Day. They are photographed here on wool batting, which I have spread out to relax. Doesn't it look soft? With any luck, the batting will get used up in a day or so. Here are some photos taken at a recent quilt retreat in New Brunswick. Camilla, from Moncton, is stitching my Maritime Beauty. She was no time getting the blocks pieced and joined together. I love how she has arranged her colours; having the darks in the centre creates a secondary square design. Beautiful work, Camilla! Thanks to Lynn for sending along the pictures. 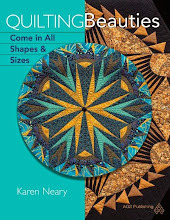 The pattern for Maritime Beauty is available in quilt shops, or directly from the checkout on my website. Thanks for all the kind emails enquiring as to whether we floated away in the rain! 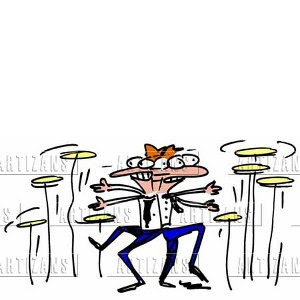 This is pretty much what I've been doing since the Fibre Arts Festival concluded- spinning my plates and going 20 different directions to try to catch up... Right before Festival began, a box arrived from Benartex containing some of their new fabrics to be showcased at Fall Quilt Market in Houston. Inside the box was this gorgeous new Forever Spring collection by Nancy Halvorson. You can see the whole line on the Benartex website. These soft rose, blue/green and gold fabrics are being worked into a new design for Quilter's Connection Magazine. The issue will be on the stands next spring, at the same time these fabrics reach the stores. The sewing is going well, and today I hope to join the blocks and start adding the borders. The bees have been keeping us busy, getting them ready for overwintering. They were a bit grumpy during all the rain of the past week, but now that sunshine has returned, their dispositions are also much sunnier. Yesterday when we visited they were happy to be out and about. We took a day this week to visit Saint Francis Xavier University in Antigonish, Nova Scotia as youngest son is deciding on a school for next year. It is a beautiful campus with well-kept buildings. Naturally, my first choice of schools would be Mount Allison - my alma-mater - but the close proximity is a bit of a problem. I do agree that I probably would not have gone there either if I had lived so nearby when I was younger. We were all very impressed with St. F.X. I also managed to (finally) get the laundry room painted (a soft, sage green) and a pile of paperwork off my desk. Once the quilt is finished, I will tackle the newsletter and then look forward to getting a couple of new designs out of my head and into fabric. I think my window of warm weather has passed to get the deck stained this season...but it's good to leave something for spring, right?